Wandsworth Town station is on the list. The station would appear to need three Subway-to-Platform lifts. I would feel that after seeing two similar lifts installed at Finsbury Park station recently, this can be done without too much disruption. After Harry’s comments to this post, I went back to the station and took these pictures of Platform 1 and the outside of the station. 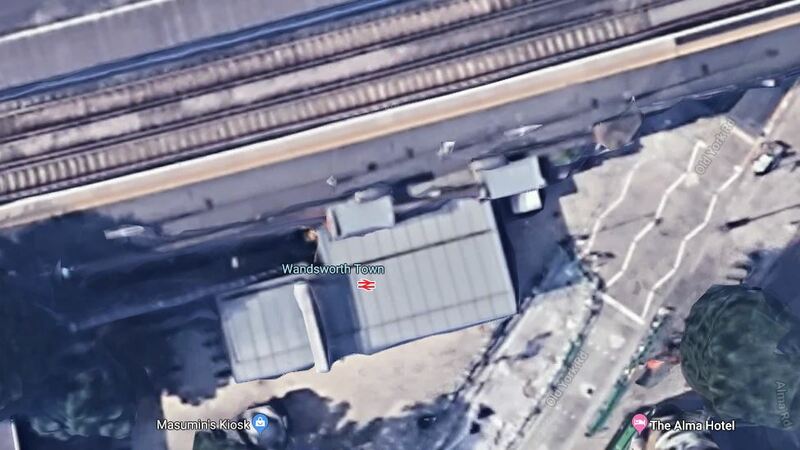 This Google Map shows Platform 1. Installation of a lift would appear to be tricky. Platform 1 is not wide enough for a lift tower. To the left of the station entrance, there is a garden with a tree, which limits the space. The best place is probably hard against the wall to the right of the station entrance, where the phone box is now! The ground floor entrance could be inside the station entrance if this is feasible. If not, why not put it outside? If the outside position were to be used on the ground floor, touch-in could be provided outside or even in the lift. The redevelopment of the Homebase site (behind platform 4) into high rise apartment blocks included provision for a new access to the station from that side. This redevelopment is now delayed as the owners of the site were trying to sell it recently. Furthermore, I suspect a wholesale revamp of the station is needed in order to provide lift access to all platforms. There is ample space but it won’t be straightforward. A lift at the base of the stairs to platforms 2/3 should be easy enough. Plaform 1 would probably need to be done behind the existing stairs and so require a new entrance on the station forecourt. Platform 4 probably the most tricky as the a lot of the buildings are already falling apart. Thanks for that! Given that there seems to be a more liberal view on ising ticket gates, we might even see lift towers outside the station to reach platforms 1 and 4. They could be modular and totally factory-built. But as at Tottenham Hale, the new development will get its own entrance. Regarding the ticket gates, since SWT lost the franchise to SWR, I’ve noticed that use of the gates has become enforced. Alongside the gateline there is a walkway through with two touch-in points but this is now almost always closed except when the station is unmanned. Even when no ticket staff are there, seems SWR are now employing contractors to operate the gates but these people have no ability to sell tickets. Very different to LNER, who have removed some gates.